Hannah Cline has her cowgirl boots on, a smile on her face, and her plans and goals set for 2019. 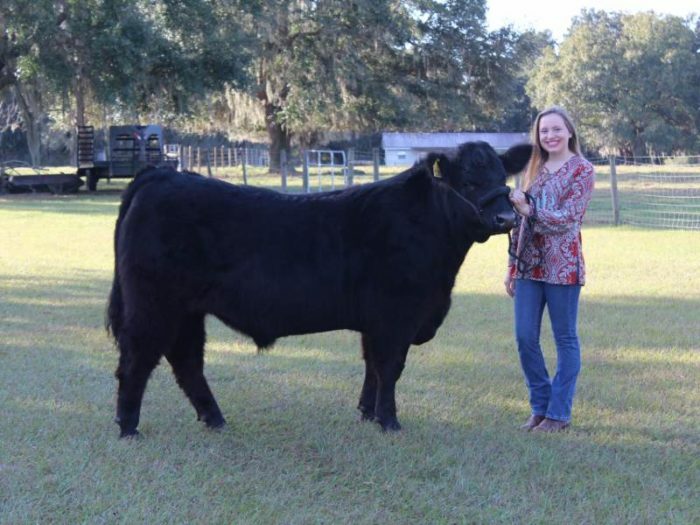 The true-blue cowgirl is the Polk County Cattlemen’s Association’s new Sweetheart. The youngest child of Dan and Sheri Cline, she has three brothers and a sister. A proud, self-proclaimed fifth-generation cattle rancher, she has attended the Cattlemen’s Convention every year since the day she was born. With gusto, guts, gumption and glamour, she is saddled up and raring to fulfill her sweetheart duties. Central Florida Ag News (CFAN): How did it feel to learn you would be the new PCCA Sweetheart? Hannah Cline: I was so excited, and so nervous at the same time. I have never done anything like this before, and I am not used to putting myself out there and talking to large groups of people. But I am so excited to give it all I have, and to just learn more and more about the beef industry. CFAN: Did you grow up in a lifestyle that prepared you for serving as the Sweetheart? Cline: I was born and raised in Polk City, where my family owns and operates a cow-calf operation. My parents have been doing this since 1986, and it has just grown over the years with continual help from me and my siblings. I was a part of Polk City 4-H since I was 8 years old, and during that time I showed six steers, five heifers and one bull at the Polk County Youth Fair. Having grown up out on the ranch, I learned the important, day-to-day aspects of the beef business. I am prepared to be the Polk County Cattlemen’s Sweetheart. CFAN: What are your goals for your tenure as Sweetheart? What will be your focus? CLINE: I will focus on promoting and educating others on the beef industry. I am majoring in nursing. I want to highlight the health benefits of beef. I want to advocate on behalf of the health benefits, and on ways to have a healthy diet encompassed with beef. CFAN: What are your personal plans for the future? CLINE: I am currently a student at Polk State College, where I am a nursing major.. I want to be an RN, and just work to help others. I enjoy helping people and making them feel better. My plans down the road are to eventually own and operate my own cow-calf operation in Polk County. I would love to raise a family, and have them be involved the way I was, and still am. CFAN: What would you like for people to know about the cattle industry? CLINE: I want people to understand where their meat comes from, from start to finish — from the day the calf is born to the day they are slaughtered. The whole process is long and hard and time-consuming, but it is worth it when you have a nice piece of steak on your plate or a nice paycheck that displays your hard work and efforts. It is not just all about this piece of meat comes from this cow. It starts out with a cow-calf operation like the one my family has, where the calves are born and raised and are sold at around 500 pounds. They are then are shipped off to the middle man, where they are at feedlots until they reach 800 pounds. They are then sold to go out West, where they are fattened up to reach 1,000-plus pounds. Ultimately, they are slaughtered and the meat processing begins. CFAN: When not performing Sweetheart duties or going to class, what do you do in your spare time? CLINE: I enjoy helping my Dad and my three brothers on the family ranch whenever I can. I also work at Publix as a member of the customer service staff. I love spending time with my family and being involved in the lives of my nephew and nieces. I enjoy traveling and going on family vacations. I am going on my first mission trip — to Costa Rica — with First Baptist Church at the Mall and One More Child.